Troels Richter has worked as a developer, Scrum Master, team leader and Agile coach at Trifork throughout the last 6 years. His experience from different kinds of roles and projects has made him realize that agility is more than methods and processes – it is a way of living. His interest in personal development is outlived in his spare time startup with the dedicated goal to improve your effectiveness through simple tools like Kanbana. This mini book is for everyone who is struggling with a high daily workload and often juggling with a lot of projects at once. Maybe the clear picture of what you are doing is missing leaving you stressed out with a constant feeling of being behind schedule? This sounds like a horror story but it has become the normal case for too many of us. 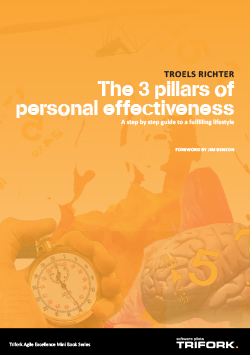 The purpose of this mini book is to introduce you to the world of personal effectiveness and through simple steps help you get a better sense of importance, optimize your focus and improve your workflow in order to achieve more value. The tools used are primarily a combination of Personal Kanban and The Pomodoro Technique®.